Edward E. "Ted" Kaufman (born March 15, 1939) is the former United States Senator from the state of Delaware, aftering being appointed by Governor Ruth Ann Minner to replace now-Vice President Joe Biden. He is a member of the Democratic Party and has voted with his colleagues 96.1% of the time. 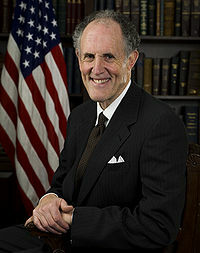 Previously Kaufman served as Chief of Staff to Senator Biden. Ted Kaufman announced he would not seek reelection in 2010. This page was last modified on 27 June 2016, at 16:44.